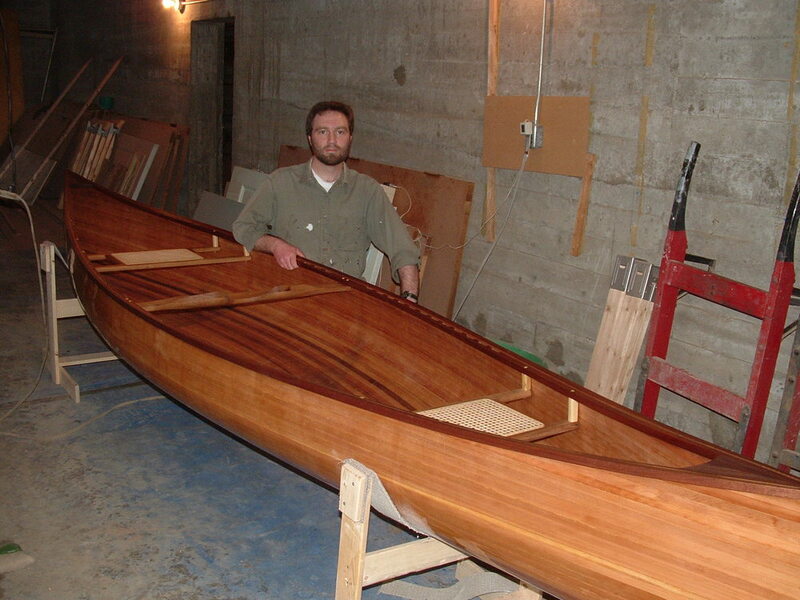 So I built a cedar strip canoe back in 2006/2007 while at the seminary. Lot's of people ask how you do it. Here are a few photos to give you a sense of the process. You actually build the canoe upside-down on these forms. Eventually once all the strips are glued in place, you lift the canoe off these forms. 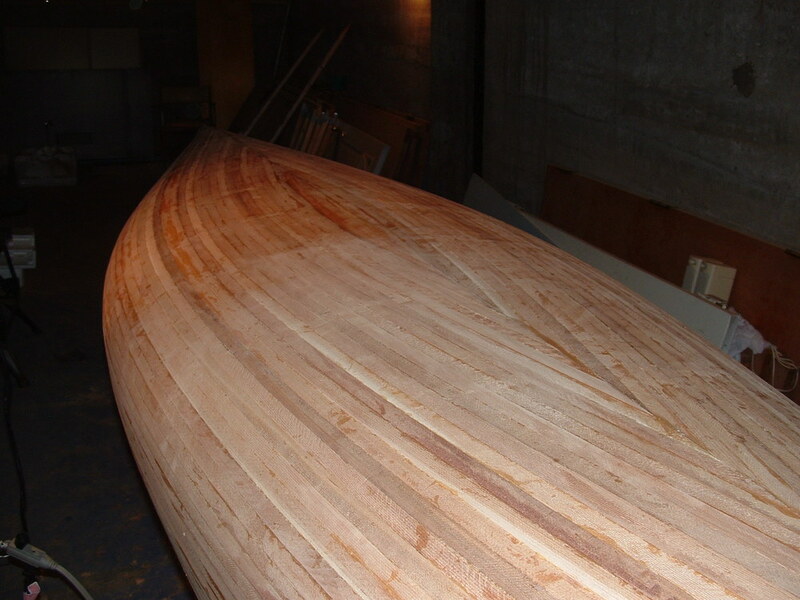 The forms are spaced about 1' apart, and the canoe is 15' long, so you need about fifteen. I cut them out of 5/8" MDF. Strips are 16' long, and 1/4" x 3/4", with bead and cove router edges. Wood is western red cedar. A bunch of strips have been laid and glued. This process takes a while because you can only lay a few strips at a time before waiting for the glue to dry. The last few strips are called the "football" because of the shape. Note the blue chalk line. I will lay all the strips for half the canoe and then cut straight along this line. Glueing on the stems (end pieces). The wood is black walnut. Once glued on, they get shaped to make a nice clean end on the canoe. Once all the strips are glued and stems are shaped, you give the whole thing a nice sanding to get it real smooth. This will make sense with the next few photos. This is the fibreglass. Literally, a big sheet of glass fabric. The fibreglass and epoxy is what seals the canoe and gives it strength. Note that the epoxy turns the fibreglass clear when it is applied. 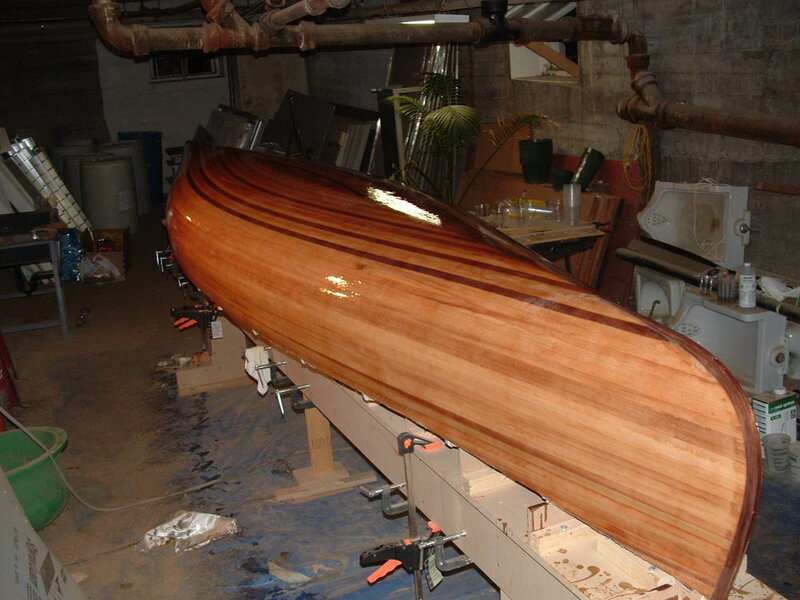 The outside of the canoe fully glassed and epoxied. Note that you cannot see the fibreglass anymore. 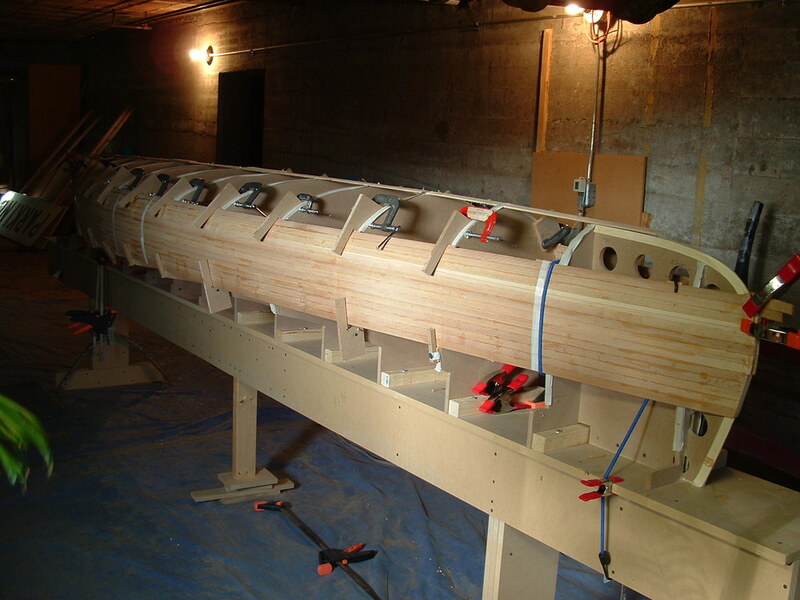 Canoe has been lifted off the forms, and now gets prepped for glassing the inside. Same process for the inside. Fibreglass cloth and epoxy. Note how the glass disappears under the epoxy. 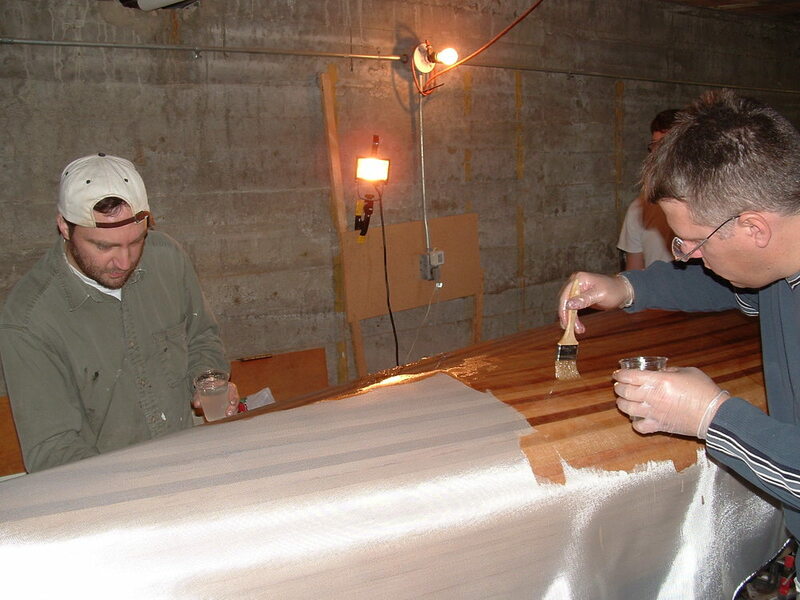 Once all the epoxy is cured, the whole canoe gets a good sanding to prep it for varnish. The canoe is leaning under the weight of all the clamps. Each gunnel has an inside and outside component. All gunnels and trim is installed, sanded and ready for varnish and oil. Looks much better with the varnish. 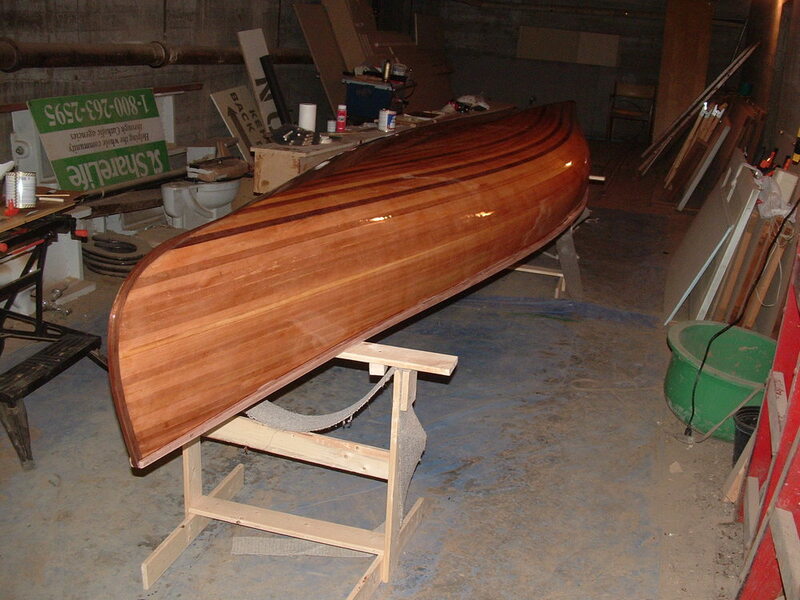 Canoe was finished on Divine Mercy Sunday, 2007. Weighs 50 lbs, and easy to carry. This was on my second trip with the canoe, summer of 2007, in La Verendrye, Quebec. A nice boat to fish out of. Caught this pike in Temagami. I let him go immediately after this photo, and he happily swam away (probably only to get caught again). Handles waves like a champ. I know how to make a canoe, and how to enjoy it. I know how to build a cabin, and how to live in it. But You O God, You made us, and You live in us. The things we make last for a few seasons. We only use the canoes we create for a short time. But Your love for us will endure so long that we cannot count the time. You will comfort us forever. Copyright © 2003-∞ by Fr. Adam Voisin. All rights reserved.